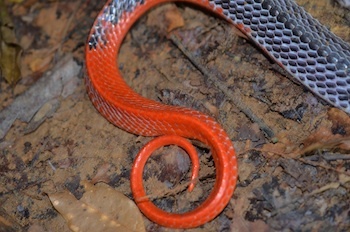 One of the top 10 most toxic terrestrial venomous snakes in the world resides in Thailand, and it is second behind the Bungarus multicinctus in strength of venom, according to LD50 charts for subcutaneous venom injection (in mice), is the Malayan Krait, also called the Blue Krait (Bungarus candidus). I’ve been looking for one of these snakes in the wild for a couple of years. I don’t herp at night all that much so it was really unlikely that I saw one for a bit of time – but I was due to see this one. Update 2015 – I’ve seen around one dozen of these snakes. They seem to be active most from 9 p.m. to 11 p.m. cruising the ground along sidewalks or rocks. They are not big biters, and I’ve only seen one bite the tongs as I picked it up. 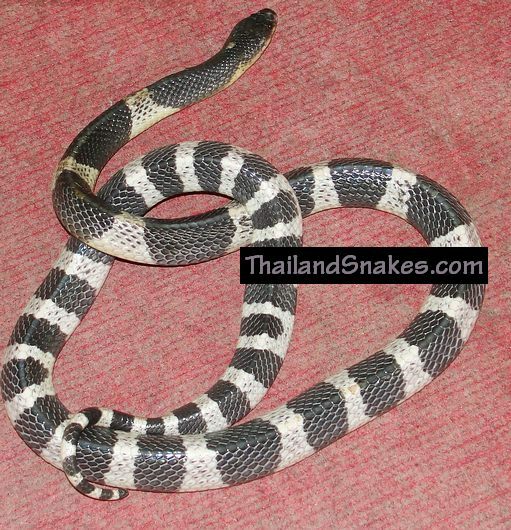 These are relatively common snakes in Krabi province. This is the ultimate krait for me in Thailand, for me. I’ve caught monocled cobras and maybe 60 other kinds of snake. Last night I hit the jackpot by catching the lovely Malayan Krait – the black / white banded snake you see in the video. I was herping with a guy from the UK, Michael. He found a red-necked keelback about 30 minutes before. We were herping HARD all over this great wildlife area and I was fully prepared to find nothing more. It was hard herping. I stopped on the sidewalk for a second and was shining my flashlight (9pm) on the greenery just below the sidewalk (and next to it). I couldn’t mistake the black/white pattern as the blue krait moved just inches from Michael’s feet. I said loudly – KRAIT KRAIT! Move back, move over here! My first instinct, before I opened my mouth was to grab that sucker with the tongs and bag him. As I moved to do that I realized Michael might get a good bite! Anyway – after he moved a safe bit away I gave the initial squeeze with the tongs and pulled it up where we could see it. It was a beauty. I held it for a while as Michael searched through my backback for the snake bag. The krait got loose because I didn’t want to squeeze too hard… I found the bag – and re-found the krait who was already half under a large rock that I couldn’t have moved if I wanted to. I slowly pulled it out with the tongs and we bagged it. Today we took this video in the morning. She was calm… slow for a bit, then woke RIGHT up. You don’t want to miss this video if you handle or plan on handling kraits. They do have the potential to move VERY fast in whatever direction they choose. I was shocked (horrified!) that it came right at me in an instant. I never felt as alive as in those few seconds, I can tell you truthfully. 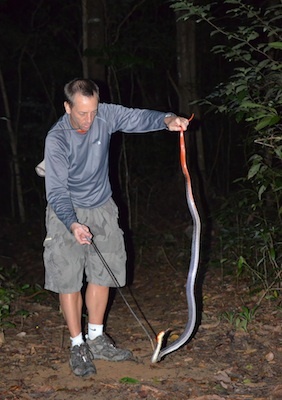 Though we tailed it – and were able to handle the krait a little bit – I never felt comfortable with it – and would never hold one, day or night. Least of all night-time. So – that’s the story. More info on Bungarus candidus here. 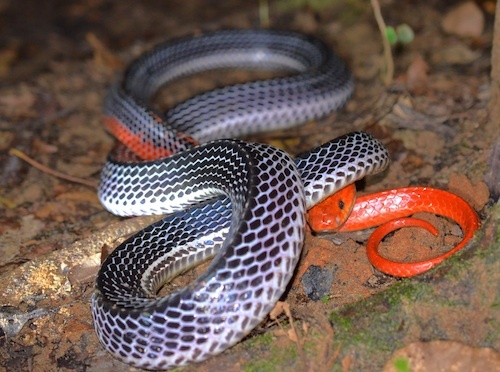 Come to Thailand and herp – and see what we can find! The video is below. You don’t want to miss the video because just after I say something like, “This snake kills a few people a year in Thailand” the krait comes at me totally unexpectedly and I freak out trying to move my feet out of the way and get back. Just by pure luck I filmed it coming at me. That was one of the scariest moments of my life – and yet my body still reacted to get out of the way. It was totally unexpected – and yet I was able to move fast enough. I don’t know whether it would have bitten me, but I don’t see why not. We had aggravated it for a good 20 minutes and it was probably getting angrier as time went on. If you work with kraits – don’t be lulled into the false sense of control that you don’t have. The krait can, at any time, turn one of your best days into the worst day of your life. There are rumors that if this krait or the many-banded krait (Bungarus multicinctus) bit you, and you went to the hospital – 50% chance you will STILL die from the venom. Not sure if that’s true – but, still – there are plenty of experts saying that, and it’s damn strong, and nothing to mess with. Please don’t hand-hold the kraits – ever.